Notes: Builder: Alco, Date: April 1962. ex-SP 4009, née-SP 7309. 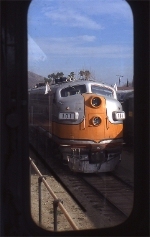 Description: Fillmore and Western F7A 101 shot through the cab of ALCO RS32 4009. Title: Fillmore and Western power. Description: Fillmore and Western RS32 4009 and F7A 101. Description: Fillmore & Western. 4009 parked in the yard. Description: Fillmore & Western. 4009 in her new Southern Pacific "bloody nose" heritage colours is the rear unit on a excursion train westbound after crossing a private road.